The front page of this June 15, 1861 Harper’s Weekly has a dramatic illustration showing the shooting of Col. Ellsworth in Alexandria, the first conspicuous death in the Civil War. We had read of Ellsworth’s heroics to take down the Confederate flag atop the Marshall House in Alexandria, but he was shot down by owner when descending the stairs. This print certainly brings the event to life. There are many war-related prints in today’s issue including three of scenes at Fort Pickens in Florida. The centerfold print has a nice view showing the City of Cairo, Illinois with many troops in the foreground, and also has a print showing a tremendous cavalry charge through Fairfax Court House in Virginia. Yet another print in the centerfold showing many soldiers digging a trench at Arlington Heights. It must have been a massive undertaking as it appears over 5 feet deep and 10 feet wide. Obviously there is more to fighting a war than firing rifles & guns. Other prints show camp scenes at Freeport, Illinois and Detroit, Michigan as well as St. Louis, Missouri. Yet another camp near Washington shows small buildings which must have been the soldiers’ huts. I would have thought only tents were used. Heroic? What’s heroic about an armed man surrounded by armed men going into another man’s private property and doing what he pleases without the owner’s permission? 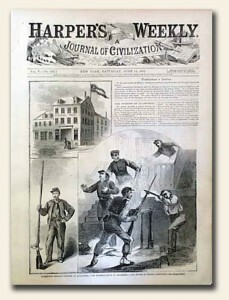 However exercised Ellsworth may have been about the Confederate flag, according to the Constitution he had no right to interfere with the hotel owner’s use of his own property and according to the then American understanding of a man’s home being his castle, the property owner had every right to defend his property even to the use of a weapon. Of course, it would seem that the federal government had conveniently forgotten that the only crime designated as treason under the Constitution in Article III, Section 3 was waging war upon the states and aiding and abetting such actions. So as Virginia was not “waging war” upon the District of Columbia but vice versa, the treason therefore arose from the actions of the federal government and those states and territories aiding and abetting the treasonous attack being waged against the sovereign state of Virginia of which Alexandria was a city. Ergo, logically and constitutionally Harper’s had its heroes reversed – and continued to do so throughout this unconstitutional and bloody war.